KNOXVILLE, Tenn. Tennessee selected Cincinnati's Butch Jones as its fourth football coach in six seasons, ending a tumultuous couple of days for both parties. The university has scheduled a news conference for 2:30 p.m. Friday to announce the hiring, which was first reported by VolQuest.com. Cincinnati already has announced Jones' resignation. 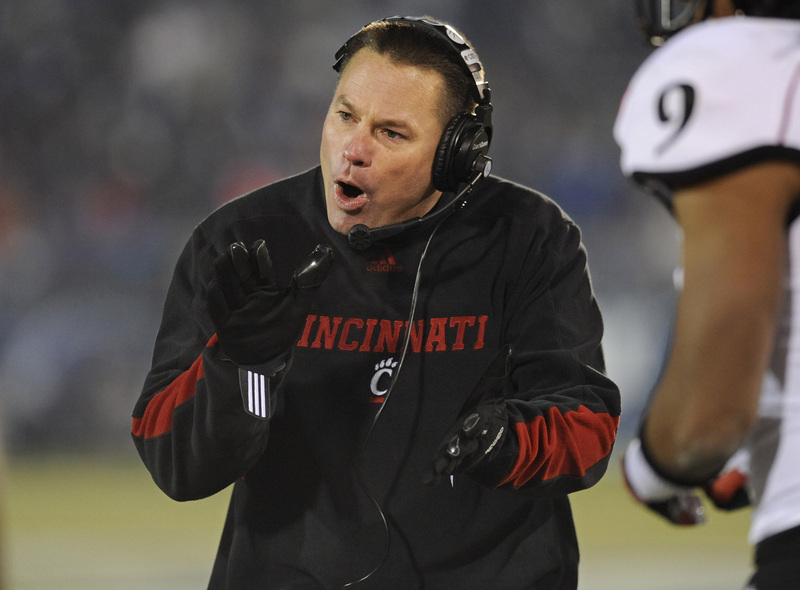 "I would like to thank Butch Jones for his time at the University of Cincinnati," Bearcats' athletic director Whit Babcock said in a release. "With that said, we are excited about the future of this program and this job will be extremely attractive nationally. Our search will begin immediately." The 44-year-old Jones has a 50-27 record in six seasons as a head coach. He went 27-13 in three seasons at Central Michigan and was 23-14 at Cincinnati the last three years. Jones now faces the task of rebuilding a former Southeastern Conference power that has posted three consecutive losing seasons. Tennessee had been seeking a new coach since the Nov. 18 firing of Derek Dooley, who went 15-21 in his three-year tenure. The Volunteers contacted ESPN analyst and former Super Bowl-winning coach Jon Gruden, who indicated he wasn't interested. The Vols then pursued Charlie Strong, who said Thursday he had turned down their offer and would stay at Louisville. On the same day Strong made his announcement, Jones was rejecting an offer to take over Colorado's program. Jones also had been linked to the Purdue coaching job before withdrawing his name from consideration. Jones will become Tennessee's fourth coach in a six-season stretch, not including offensive coordinator Jim Chaney's stint as interim head coach in the 2012 season finale after Dooley's dismissal. Phillip Fulmer was fired in 2008 after posting a 152-52 record. Kiffin coached Tennessee in 2009 before leaving for Southern California. Dooley lasted three years. After winning at least eight games for 16 consecutive seasons from 1989-2004 and posting double-digit wins in nine of those years, Tennessee hasn't earned more than seven victories in any of its last five seasons. The Vols went 5-7 this fall for their fifth losing season over the last eight years. This also marks the first time since 1909-11 that Tennessee has finished below .500 three years in a row. Tennessee athletic director Dave Hart said at the start of the search that head coaching experience was "critically important" and that he wanted a coach who "knows the difficulty of climbing the ladder in the SEC." Jones lacks SEC experience, but he has a career winning percentage of .649. Jones' teams have earned at least a share of a conference title in four of his six seasons as a head coach. After succeeding Notre Dame coach Brian Kelly at Central Michigan and Cincinnati, Jones maintained the momentum his predecessor had established at each school. Central Michigan won two Mid-American Conference championships and posted a combined league record of 22-3 in Jones' three-year stint. Jones went 4-8 in his first year at Cincinnati, but the Bearcats are 19-6 since and have tied for first place in the Big East each of the last two seasons. Cincinnati's 2011 season included a 45-23 loss at Tennessee. Jones signed a contract extension after the 2011 season that includes a $1.4 million buyout if he leaves before Jan. 1. Jones' background as an assistant is entirely on offense, but one of his biggest challenges at Tennessee initially will be strengthening a defense that allowed the most points (35.7) and yards (471.4) per game of any SEC team this season. The Vols hadn't allowed that high a scoring average since 1893, when they gave up 42.7 points per game while playing a six-game schedule. They hadn't yielded that many yards per game since at least 1950, the earliest year Tennessee's sports information department has that statistic on file. The makeup of Jones' first offense at Tennessee also remains uncertain, at least for now. Starting quarterback Tyler Bray and star wide receivers Cordarrelle Patterson and Justin Hunter all are projected as first- or second-round draft picks if they choose to turn pro rather than returning to school for their senior seasons. Bray threw for 3,612 yards and 34 touchdowns this year to rank second on Tennessee's single-season list in both categories, behind Peyton Manning's 3,819 yards and 36 touchdown passes in 1997. Hunter caught 73 passes for 1,083 yards and nine touchdowns. Patterson gained a school-record 1,858 all-purpose yards. Junior offensive tackle Ja'Wuan James also has been mentioned as a possible draft candidate.